However, we know enough to assume this is going to be one of the most interesting events on the annual beer calendar. First, we know that the brewery list includes some stellar Portland brewers--more than a few of whom have been experimenting with Belgian yeast for years: Alameda Brewhouse, Amnesia Brewing, Hair of the Dog, Hopworks Urban Brewery, Laurelwood, Lucky Lab Brewery, McMenamin's Crystal Brewery in collaboration with John Barleycorn's, McMenamin's CPR, New Old Lompoc, Philadelphia's, BJ's, Raccoon Lodge, Rock Bottom Brewery, and Roots. One of many great beer yeast to produce classic Belgian ales. Phenolics develop with increased fermentation temperatures, mild fruitiness and complex spicy character. They suggest it can be used to make everything from dubbels to Flanders browns, though that seems a stretch. Alcohol tolerance goes up to 12%, so just about anything is possible. The ability to produce phenolics could offer brewers some interesting alternatives (including saison) to the abbey-style and pale ales the yeast is probably normally used in. When I visited the Raccoon Lodge last month I tasted Ron Gansberg's project, which included some interesting botanicals as well as a laborious process. I've been touting yeast as the X-factor in craft brewing evolution. 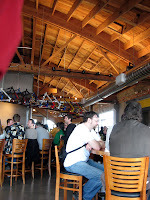 Mostly breweries have explored the ranges possible with hops and alcohol. But yeast is the most versatile, beer-changing ingredient available to breweries. I love the idea of a friendly competition that riffs on yeast, and I expect big, big things. It's probably going to be packed to the gills (Roots is fairly wee), so I plan on being there early. 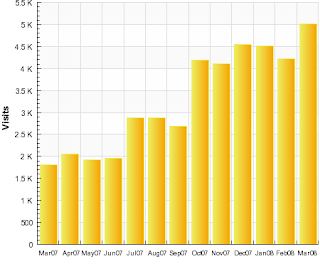 5,000 Readers in March - Thanks! This little blog is growing, and it's all thanks to you. For the first time in its history, we've topped 5,000 readers in a month (and 7,000 page views). I say "we," because this really is a collaborative effort. I post, but you read and comment, and without that, there's no blog. Writing about beer is a little sideline for me, but one I enjoy enormously. Your continued support justifies my time, and for that I offer my appreciation. By way of comparison, a year ago the site got 1,810 hits, or 58.4 a day (these are unique visitors, or unique IP hits, which is about the best we can do to measure actual readers). I should hit at least 5,150 by the end of the day, or an average of about 166 readers. That's 2.85 times more readers in just a year. Not bad! Earlier this week, I reviewed a slate of Henry Weinhard beers to the delight of many readers (I can tell by the dozens of comments). So it is with relish that I bring you yet more news of Henry's--knowing as I do how much you love the subject. At long last, I managed to get my hands on the IPA, which has been sold out every time I've tried to track it down. As you may recall from an earlier post, it's a nearly-real IPA, with 45-50 IBUs (reports vary), and 6% alcohol. Technically, both put it into the category, but they are similar to BridgePort's IPA, and BridgePort's wheelbarrow of trophies always came in other-than-IPA categories. I'd call this a shade light on hops and alcohol. But who cares how well it fits the label's designation, right? How does it taste?--that's the real question. Answer: not bad. I'd call it a decent beer in absolute terms. If my hand were descending toward a sixer of Inversion or Terminal Gravity, it wouldn't detour for Hank's. But I'd choose it before a fair number of craft beers out there--[cough] Flat Tire [cough]. In terms of flavor and aggressiveness, it's certainly passes for an authentic micro (unlike the rest of the line). It had a nice nose of citrus and earthy/pepper, a rich, flavorful hop bite, and a nice crisp finish. It's not overly complex or scintillating, but at $10 a half-rack, a very decent beer for the economical shopper. "I was there for lunch on Tuesday. Beer was great (but we already knew that), food was pretty good. Ordered a bacon cheeseburger, but somehow only got the cheeseburger - perfectly understandable on the first day and it actually gave me a very good opportunity to see how they handeled something going wrong. The server was very appologetic and was going to go get some bacon and BBQ sauce, but I had already finished half the burger. The manager (can't recall his name) came over and checked in as well. I have the feeling that they would have comped me the burger if I would have let them." "Christian was working the tables as well. Chatted with us for quite a while and groaned when we showed him the Laurelwood growlers we brought in to get filled up. We plastered a HUB sticker right on top of the tree." More, plenty more, to come. The Worst Beer in the World? Henry Weinhard has an array of interesting-sounding beers, and none more so that the invitingly-named Belgian-Style Wheat, which boasts the use of coriander and "orange." In my recent survey of Weinhard's beers, I bought two of these, thinking it would be an always reliable wit. 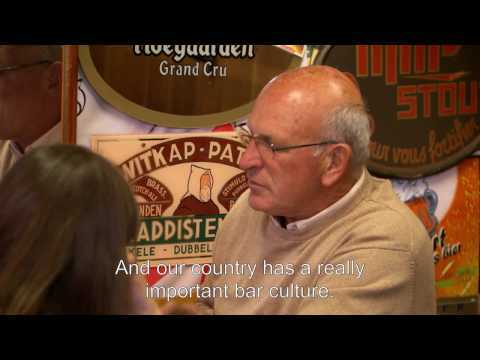 Not only is it not a wit, but Brussels should sue SABMiller for impugning their national heritage. What it is: "Orangina," Sally noted, seconds after curling her mouth into a grimmace and horsing down the last swallow she'll ever have of the beer. Seriously, it's an orange soda, from the fizzingly Fanta-like nose to the artificially-flavored soda palate. (It may not be artificially-flavored, but it manages to taste like fake orange flavoring nonetheless.) It's even orangy-amber. It's shockingly bad. Many beers are at the bottom-level of mediocre. Your Busch Lights, for example. Others are infected or unintentionally damaged. But I've never had a beer that tasted this bad intentionally, not as a result of neglect or misuse, but because someone, somewhere crafted it this way and said, "Hey, I think that's a winner!" I almost want to urge you all to buy a bottle so as to behold the badness. But I don't want it on my conscience. Still, if you've stumbled onto it accidentally and would enjoy relating your experiences, by all means do. And, if you know of another beer that's worse, let me know. This could become a theme. So I've been trying to find a bottle of the new Weinhard IPA for about three weeks. It's always sold out in the six-pack, leaving me with a half-rack or nothing. Guess which way I've gone. In yet another fruitless effort last night to get a single bottle, I decided to pick up a few of their other offerings just to see what the line is like. Here are my findings. Tasting Notes: Very pale, thin head. Hop aroma reminds me of a European pilsner, and although they're not present, hops seem like Saaz. Extremely crisp and inoffensive. Fuller than a PBR, but lacks the interest of a FS Session. Pour it into a Heineken bottle and I don't think anyone would notice. Upshot: It says something that the pale ale is brewed with fewer hops than the Hef (see below). It's better than I recall the old Blue Boar Pale Ale of 80s vintage being, but not much. Target Audience: Clueless folks who have heard the word "Hefeweizen" but don't know the difference between Henry's and Widmer. Tasting Notes: Sweet on the palate but backed by a strong wheat note. A tiny bit of smokiness, suggesting the barest of nods to the original style. Honey adds that characteristic structure you find in the mouth--sort of a creamy, viscous quality the unfermentables leave behind. Upshot: The closest of this bunch to a craft beer. Sort of tasty, in a slummin' it kind of way. Tasting Notes: See this post. Target Audience: Unclear. This beer is slotted in the PBR category, but by naming it "Blond," they eliminate the principal clientele of the product: poor young men. Go figure. Tasting Notes: A straightforward light lager. The front end's actually pretty tasty--slightly sweet but crisp, fresh--but it bottoms out and finishes with a thin, metalic bitterness. Upshot: If you spit it out immediately, you'll think it's akin to Pacifico, but if you swallow, you'll perceive its American tin-can heritage. Over the weekend, a friend sent me another report from Bend about the Mirror Pond changes, alluding to the potential use of hop oil. I speculated to him about that (Brett Porter's now at Deschutes, and he was a hop oil fiend at Portland Brewing back in the day) and then decided to actually ask the brewery. What a novel idea. From the horse's mouth comes further information about the Mirror Pond rejigger. Or potential rejigger. Fascinating stuff and a look under the hood, so to speak, on the nature of recipe evolution. I quote in full (though break it into paragraphs for ease of reading). 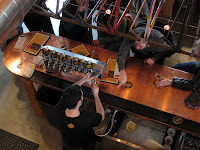 "We brewed 4 batches that differed based on where they were brewed (at the pub or one of our other two brewhouses at our larger facility) and the hopping regimen. Yes, I think two were not dry-hopped, favoring instead a different hop-back treatment using the hop-back we built for Portland in line after our hop-back on our 50 bbl. System. We did not use any hop oil or extract in any of the brews. We did use some hops with some of the vegetative matter removed to see what kind of result we would get. It is interesting in that, while we experiment continuously, this particular experiment has gained considerable speculation on why we are doing it. I can tell you it has neither to do with the availability of hops or their cost as all brews were essentially the same (another part of the experiment) in their hop usage. We, as I have previously stated, are continuously looking for new, creative ways to improve our beers. This experiment is not different. We do not have plans to “change” Mirror Pond, although change in everything is inevitable (hopefully for the better)." So, while I was wrong about the hop oil, you'll see that my larger speculation about the brewery was correct. This further confirms my faith in a brewery that appears outwardly to challenge market-driven brewing and favor good beer to tradition. But no hop oil as yet. Did you see it? It reads "Celebrating the repeal of the 21st Amendment." It's the 21st Anniversary of the start of the fest, and being a little too clever, organizers must have thought they'd go for a triple-entendre: 21 is the fest's age, also the legal drinking age, and the 21st Amendment created prohibition. So organizers determinded that this year's theme would be the repeal of the 21st. Except that the Amendment that created Prohibition was the 18th. Apparently, organizers are "aware of the problem" and we should expect to see a revision to the poster. As it turned out, I did end up blowing off the Spring Beer Fest (I may have a guest correspondent with some reax, though). Instead, I pulled a bottle of Bone Geuze out of the fridge and had it instead. Originally intended as a yeast-culturing project, I got busy, six months went by, and I finally decided to bag the culture and drink the beer. I don't report back all the non-Oregon beers I try, but some, like this one, are worth a mention. 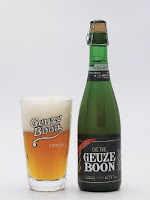 Gueuze (Bone's spelling is idiosyncratic) is generally a blend of young and old lambic. It goes through a secondary fermentation in the bottle and, unlike some lambics, is extremely lively. This is perhaps the origin of the name, for "geyser," or maybe not. (Pronunciations vary, depending on who's speaking, but the Flemish is gerz or gerz-ah. Oh, and incidentally, Boon is pronounced "bone.") As with other lambics, gueuze is made with a partly-wheat malt bill, is originally spontaneously fermented, is mostly absent hop flavor, and is characterized by a flavor spectrum ranging from sour and tart to dry and sherrylike. Since they are spontaneously fermented, these characteristics are uncontrollable and variable not only brewery to brewery but year to year. As proof that the microbrewing phenomenon was international, in Belgium a wave swept the country that was roughly contemporaneous with the US's. Frank Boon founded his traditional brewery in Lembeek on the River Zenne in 1982--in the town lambics were originally born. There are two versions of Geuze: one featuring his best lambics ("Mariage Parfait," 8%) and the standard version, which is milder (6.5%) but still one of the most complex lambic-family beers I've ever tasted. It is corked, and true to the "geyser" of possibly apocryphal fame, the cork rockets off in the manner of champagne. The beer doesn't bubble out of the bottle, but it does have an almost violent bead that roils off the bottom of the glass, feeding a fluffy white cloud of sustained head. The aroma was dominated by grapefruit and sourness at first pour. When it opened up with warmth, I found elements of coriander, lavender, and a wheat-breadiness. The palate was remarkable: aggressively sour and acidic on the first taste, so that I expected it to overwhelm any other note. But like a grapefruit, it gave fairly quickly away to bitterness. As it continues to evolve on the tongue, there's a soft, bready middle, and a long, dry, sherry-like finish. There's also a salty quality, sort of like bicarbonate, that combines with the wheat to taste a little like Irish soda bread. In passing, I also discovered some pepper and that lavender note from the nose. It is a little beyond rating in its singularity, but I would strongly recommend it for anyone who likes the sour ales of Belgium. But maybe I'm wrong. If you're heading down, report back and let folks know what's shaking. If I do make it tonight, I'll of course post on it. Meantime, if you are downtown, there's a sublime IPA by Double Mountain on cask pouring at the Pilsner Room. Amazing, amazing beer. Charting the currents of beer trends leads you into strange waters. How, for instance, did brown ale become the beer of spring? I waited for well over a decade to see a decent brown hit the commercial market, and when it finally did--I'm thinking of Buzzsaw here--it was quickly followed up by another, Beer Town from BridgePort. And just yesterday, I discovered the current Full Sail Brewmaster Reserve--a Nut Brown. From nowhere to official Spring beer in a couple years--who'dda thunk? 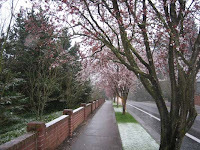 It's a good style for Oregon Spring. Breweries used to release lighter, sunnier brews that didn't match the chilly, slate-colored reality. They were overly optimistic. Browns are lighter than winter styles, but hearty and warming, befitting a climate that can deliver drizzly, mid-50s weather through May. In England, the venerable Newcastle brewery actually introduced its beer as a rival to pale ales in 1927. That beer is light and bright, with toffee and banana notes. Other browns can have a richer, winier quality while others are nutty. Of the three bottle browns now available, Full Sail's pushes further out into the hearty and robust than Beer Town and Buzzsaw. It pours out almost porter-dark, but light does refract through, revealing a bright, deep brown. The aroma is floral/citrusy, lifted up by nutty malt. It is sweet on the front of the palate, but slightly earthy and rooty. In fact, it even has a root beer quality. The malt is quite nutty, tending toward astringent in the manner of almonds or walnuts. Browns should be creamy, and this one is--almost frothily so. I tend to like browns with a little more oomph, and I enjoyed the depth and richness here. 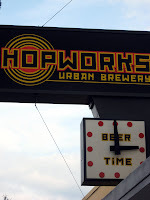 The Hopworks Urban Brewery, a phantom establishment that has managed to make and sell beer for nearly a year without actually being open for business, is finally ready to let the public in. Based on the account John Foyston offers in today's Business section of the O, it's going to have been worth the wait. "We're on track to brew 1,800 barrels (about 56,000 gallons) in our first year," he said, "We planned on 1,000, but we had no idea that the beer would take off like it did. So we are having to scramble for some ingredients, but that's a good problem to have." The grand opening is set for Tuesday, though I don't have info on the time. I'll let you know as the date draws near. I expect it will be a well-attended debut. An average pint in Britain has topped £3 following a 4p rise in the budget – making it the same price as a line of cocaine, according to official government figures. In London the average price of a pint – at £4.06 – is dearer than a hit of heroin. Three pounds is currently $5.95. The London price is outrageous by Beervana standards--$8.05! The article continues, comparing the price of beer to other illegal drugs. Single pills of Ecstacy are going for £2.91, and a shot of heroin is £3.50. And so the movement spreads. 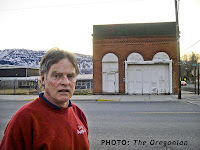 The enterprising Bruce Miller, throwing himself into a story for Bend's The Source Weekly with little regard for personal safety or liver health, has spent some time in the town's alehouses measuring "pints." Having a few typical pub-style “shaker” glasses (so called because they’re the kind used in combination with a metal cup to shake cocktails) around the house, I decided to put Alworth’s claim under scientific scrutiny. The testing apparatus was highly sophisticated: one of the glasses and a 32-ounce measuring cup. I filled the measuring cup with water to the 16-ounce line and carefully poured it into the glass. Sure enough: When the glass was up-to-the-brim, couldn’t-hold-another-drop full, it contained exactly 14 ounces. Obviously there was no way in hell to fit a true pint of beer into that thing. At McMenamin’s I called for a pint of IPA. It arrived in one of the “shaker” glasses with a half-inch head on top. Pouring the beer into my 32-ounce measuring cup – and getting a lot of peculiar looks from servers and customers in the process – I determined that the liquid content was a scant 13 ounces, three ounces shy of a full pint. Then it was time to stagger out to Cascade Lakes, which also pours imperial pints. My IPA ($4) had only about a quarter-inch of head and contained a bit over 18 ounces. Bartender, partner and president Chris Justema told me his pub and the Deschutes Brewery are the only ones in town that use the imperial pint. But he said the Bend Brewing Company also serves up honest pints in English-style pub glasses, so it was with eager anticipation that I headed there to perform my last research of the day. Alas, my bright hopes were dashed. A “pint” of Outback Old Ale for $4 and turned out to contain barely 12 ounces – 25% short of the full-pint mark. 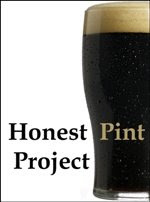 So there you have it: two new Honest Pint purveyors to add to my list. Thanks for sacrificing yourself to the cause, Bruce! You will not find Left Hook Lager on the grocery shelves. You won't be able to go to a brewery to find it. Instead, this special release is available only one place: Democratic Senate candidate Steve Novick's campaign office. [R]aise a glass to Steve with your friends. Orders will be processed on March 14 and March 21. Sorry, no deliveries and no shipping. Pick up your brew with valid proof-of-age identification at the office anytime March 14th or after. We'll be keeping it cold for you at 1339 SE 8th at Madison, Portland, OR, pick up M-F 8:00 am to 6:30 pm, Saturdays 10:00 to 4:00. Payment by cash or check can only be made in person at the campaign office on March 14 and March 21. The beer is a special, only-in-Beervana fundraiser for Novick's campaign. A single 22 is ten bones, and a case (12) sets you back a C-note. I have tried to track down the origins of the beer, but so far I have had no luck. 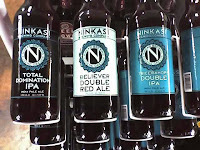 The one bit of info: it's brewed by Ninkasi. The only lager the brewery makes that I'm aware of is Schwag, so it's probably not a bad guess to think that's what Left Hook is. But so far I haven't been able to track down the info, and I'm too cheap to drop the money to, you know, actually taste it and see. 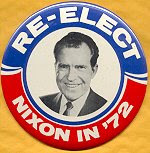 However, as a political junkie, I think this would make a far nicer collectable than a campaign button. If anyone knows anything, holler. If someone's willing to buy a bottle and report back, by all means do so. [Update: the Novick campaign actually has a couple of release events associated with Left Hook Lager. Left Hook Lager St. Patrick's Day Beer with Steve-the special release of our campaign mircrobrew! Full Sail brewer John Harris just e-mailed (from Hawaii, where he's vacationing --- now that's dedication...) with the news that the folks at the Pilsner Room at McCormicks and Schmick's Harborside Restaurant are tapping a 10-year-old keg of Full Sail Imperial Stout for St. Patrick's day...it should be amazing...they'll also have a keg of 2008 Imperial Stout on tap so you can do a steeeep vertical tasting. Also, in comments to the aging beer post below, Bill from It's Pub Night points me to this extraordinary site on cellaring beer. It includes tips, experiments, and of course, recommendations. Let us reflect a moment on 1999. I was barely into my 30s (! ), and the Clinton administration was dealing with impeachment. The Dow closed above 10,000 for the first time. American Beauty won the Oscar for best picture, the Broncos won the Super Bowl, and the Yanks won the World Series. Ah, the good ole days. In the beer world, it was also a different world. There was a company you might recall named Portland Brewing Company (PBCo to employees). It hadn't yet become MacTarnahan's, nor was it owned by out-of-state Pyramid. The brewery had recently expanded--perhaps the first step on the death knell of consolidation--buying Saxer and inheriting the Nor'Wester portfolio in the deal (both labels are now dead.) It was also during a year when Head Brewer Alan Kornhauser was overseeing Pabst's operations in China, and assistant brewer Brett Porter was manning the tun. Porter introduced three or four really exceptional beers, and I thought the brewery might turn it around. He made a hop-oil-based pale (Oast Ale) that was vividly hoppy; an exceptional dry-hopped dry stout (Thunderhead Cream Stout, a name Pyramid approrpriated for its IPA) , and BobbyDazzler. I believe it was also dry-hopped--a preference of Porter's--but the details of the beer are lost to me. It was good enough that I bought a sixer to put away, and I now have two remaining. I cracked one last night, and enjoyed the rare pleasure of a very nice aged beer from a kinder, gentler era. 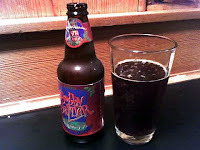 BobbyDazzler, as was the case with all of PBCo's beer, was not bottle-conditioned. It is therefore substantially oxidized (though any 9-year-old beer would be somewhat), the effects of which come through in both in a chocolate-sherry note in the aroma, and a strong sherry character in palate. This is one of several possible results of oxidation, and the one generally forgiven by beer geeks. The flavor is produced when melanoidins in the beer become oxidized. There are other flavors oxidation can produce, generally regarded as flaws: diacetyl (a buttery flavor) which occurs when another chemical, a byproduct of yeast ( alpha acetolactate), is oxidized, and a metallic, blood-like flavor. In the BobbyDazzler, I only pick up the sherry note, and it's intense. Combined with the alcohol, it does taste more like a liquor than a beer. There's a port quality, a refined, dry flavor that has dark fruit (plum and raisin), smoke, almonds, and woody elements. The hops are not evident individually, but it does not cloy. The aftertaste lingers a long time, in the manner of pipe smoke, roasted meat, or scotch. The more I drank, the more I liked it; my mouth became saturated with the flavor, and it lingered delightfully there for a half hour after I finished the beer. As with all aged beers, it had transformed almost unbelievably. The sharper notes of hopping were completely gone, and the malt had been altered by oxidation. It was impossible to have a drink of the beer and trace the flavors present there back to the original recipe. It was, nine years on, a wholly different substance. The alchemy of metals may have been a bogus science, but in the transmutation of BobbyDazzler, I found it at work in my basement. The lesson is that you should stash a sixer or two in the basement every six months or so. Dark, strong beers age the best, and bottle-conditioned beers even more so. The flavors the beers produce after nine years is unlike anything you can find in a commercial product. It requires patience and a reasonably cool place (reliably under 65 degrees, the less fluctuation the better). It doesn't cost a lot of money and the payoff is amazing. Plus, as you soon realize, the years roll by faster than you expect. You start digging around and pretty soon you find 10-year-old beer in the basement. And then all you have to do is muster the courage to crack it open and see what alchemy it contains. Save the Blue Mountain Brewery (Building)! You probably missed this story in the Oregonian yesterday. It details the fate of a 129-year-old building in tiny Union, Oregon (Southeast of La Grande), where one of the oldest buildings in the town is slated to get torn down. Union's Main Street is lined with 40 picturesque Victorian-era homes and businesses, including an 1881 bank, a 117-year-old city hall, and a three-story red brick hotel built during the Roaring '20s. Those properties were added to the National Register of Historic Places in 1997. 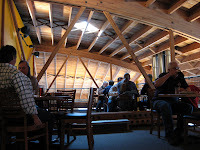 The bus barn is the former headquarters of the Blue Mountain Brewery. In the late 19th century, City Hall was next door and the jail occupied an adjoining building. The building was purchased by the school district in the 1950s and until about two years ago was used to garage school buses. While it is nice to have all the speculation, and our announcement does not give much background on why we are experimenting, I assure you we are not trying to "re-invent" anything, nor are we suffering any kind of crisis with Cascade hops. We found a creative formulation change that produced a Mirror Pond that tasted different; good but different. Is this a direction we should think about going (after all, it has already been pointed out, evolution is good.) or not? We never want to assume we are "good enough." In either event it is always nice, and fun, to ask those whose opinions we value the most, our customers. We have held these "polls" before at our pub and customers have gotten quite a kick out of it, and we got some valuable information. I'm interested in your opinion as well. Be sure and let us know. Mess With a Classic -- Why not? Mirror Pond Pale Ale Experimental Trials! Jon concludes that it's hard to find "anything that needs 'improving' or 'fixing.'" At the risk of committing apostasy (again), let me dissent. Because, no matter how hallowed Mirror Pond may be, that doesn't mean it's fully evolved. When John Harris's recipe was unleashed on the public over a decade ago, it was a revelation--wonderfully flavorful; a celebration of Cascade hopping, sweet, citrusy, but easy-drinking and light. However, in 2008 an all-Cascade pale must share shelf space with many others (in, admittedly, the right beer store). So to keep its edge, I think Mirror Pond could afford a wee bit more oomph. Perhaps another hop style for complexity, and/or more hops later in the boil for richer flavor and more intense aroma. It would be quite possible to add character to Mirror Pond without sacrificing its Mirror-Pondness or alienating longtime fans. With the right tweaks, it could be a brighter, sharper, even more delightful beer. Sure, it's 90% perfect now--but a brewery like Deschutes might prefer perfection to tradition. Beers do evolve. Maybe it's Mirror Pond's time. Every year, as American brewers get more creative with ingredients and methods of brewing, the brain trust in Denver tries to keep up with new style categories. As Stan points out, this year there are 11 more. 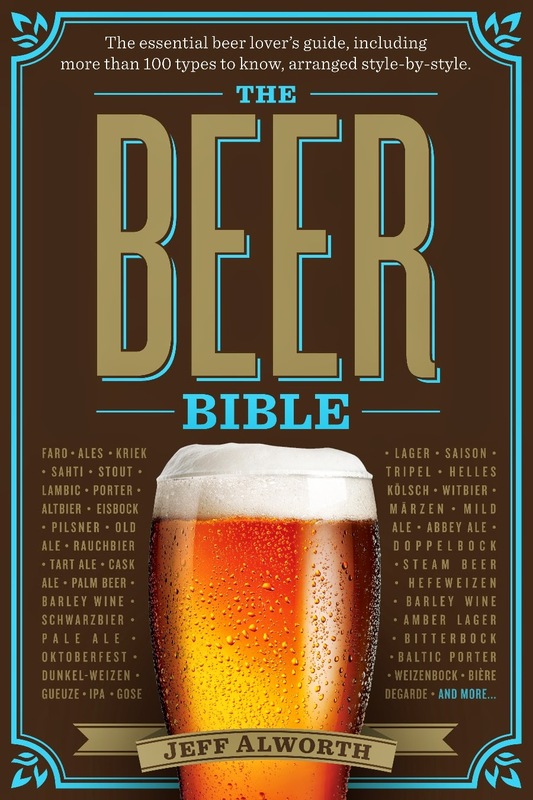 The metastasizing of beer categories bears some resemblance to the Diagnostic and Statistical Manual of Mental Disorders, which began with 106 disorders and now contains 297. The unique variances among individuals dictate an infinite range of possibilities, and at a certain point, the DSM will create more confusion than clarity (many people feel we've passed that point). And so it is with beer styles. The function of categories and styles is to bring some coherence to comparison. There's just too much difference between a doppelbock and an IPA to meaningfully compare them side by side. But what happens when a brewery uses an alt yeast for its doppel and tosses in a few extra new world hops. Is it still meaningful to make a new category, or just compare it with other doppels? Ales which are hopped exclusively with fresh and un-dried (”wet”) hops. These beers portray the unique characters imparted by yeasts typically used in fruity and big Belgian-style ales. Here's the thing, a fresh hop ale, to take one example, is brewed in a recognizeable style--usually pale ale. It doesn't need its own category. American styles are distinguished from their British counterparts by their hop character solely. Every time we get a new hop, we have to come up with a new style? Absurd. And imperializing something (there are now 47 categories for "imperial" styles) means you've just made a strong ale, not an Imperial or Double India Pale Ale. For the love of Pete, just collapse these damn things. Gluten-free beer? Really? I know that this creates a way for more breweries to win more medals, but that's actually a problem. I need six beers to win in the Light American Wheat Ale or Lager with (or Without) Yeast categories? No! It adds nothing to clarity and creates a huge headache for everyone involved as people try to figure out in which precise category a beer should be placed. If I ruled the world, there'd be a lot more good beer available, but you'd know it by a lot fewer names. Also on Saturday, get ye to the Raccoon Lodge, where Ron Gansberg is hosting a tasting of his extraordinary sour ales. My review is here. He'll have the sour fruits (cherry, blackberry), as well as the Apricot tripel. That last one is in rare supply (and wasn't at Belmont Station yesterday), so it's an opportunity to try it and buy some to lay away. He will also let you try the cuvee, which won't be released for sale until later this Spring. I wrote about these ales in a long post last week. Go support his experimentations and buy a bottle or two. 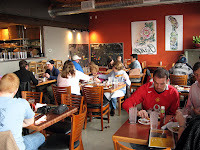 We have changed the venue this year for our annual BW&BB Tastival to our Quimby location. Join us to sample the most interesting collection of beers around. We should have almost 30 beers including barleywine, imperial porter, cask aged beer, imperial stout, aged beer, etc. There is no entry fee and sample tickets are $1.75 each (double tickets for some ridiculously expensive stuff). www.beervana.blogspot.com. Please contact me if you are interested. Dunno about you, but there seems to be a conflict of interest in paid and unbiased. So I'm passing. Beervana may have sloppy writing, be riddled with types typos, and offer occasionally suspect opinion. But at least you know it wasn't paid for. That's the Belmont Station, and a rack devoted to the boys from Eugene. It's not cheap at $6-$8, but relatively cheap at $4.29/$6, given that they are pretty big beers. Over the weekend I had a chance to make it beyond the comfy inner eastside where I spend most of my time. A friend invited me to try the Highland Stillhouse, way down the river in Oregon City. It's a nondescript building overlooking busy McLaughlin (and beyond it, the industry-lined Willamette River), not particularly promising as you approach it by car. But inside, it's a classic Scottish pub, cozy, dark, and wood-paneled. For beer fans, there's plenty to delight. The pints are honest, and the taps flow with well-selected ales, including several that are pumped from casks. 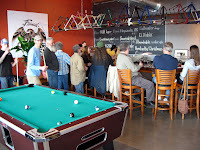 Over the weekend, they had Ninkasi Otis and Full Sail Slipknot on cask (among others). That slipknot is a thing to behold. The website has a representive, but out-of-date list of offerings. But the real reason to go to the Stillhouse is whisky (which is just concentrated beer, right?). In addition to Irish, American, and Canadian offerings, they have a massive selection of Scotch. I count 59 brands (most with multiple vintages and treatments), including 24 Speyside malts, 10 Highland, six Lowland, three Campbeltown, eight from Islands and the West Highlands, and eight Islays. For Islay fans, as I am, that is a complete list. It's a mellow place and a welcome site for folks living South of town. And worth a drive for those of you who love single malts. John Foyston has posted a press release from Henry Weinhard's announcing a new release: India Pale Ale. Henry Weinhard's IPA is a blend of Challenger, Simcoe, Chinook and Summit hops. It contains 6.0 percent alcohol by volume. The new brew will be available in Idaho, Oregon and Washington where Henry Weinhard's products are sold for a limited time only! Suggested retail price is $5.99 for a six-pack. "Pacific Northwesterners are notorious lovers of IPAs and we're delighted to offer them a beer we know they'll appreciate," said Jennifer Gerrie, brand manager for Henry Weinhard's. "This IPA is a premium craft beer we feel the biggest of hop heads will enjoy." Never mind that in some places on their website the beer is referred to as Indian Pale Ale--this is rather extraordinary. When they released the Organic Amber last year, I was impressed by the serious attempt they made at producing a craft-level beer. It was an attempt to mine the micro market's most lucrative vein--blander, less aggressive beers dominated by Widmer and Fat Tire. But releasing an IPA raises the ante, doesn't it? It's a small IPA, at 6% and 45 IBUs, yet that's light years more agressive than anything I've seen coming from the corporate halls of MillerCoors. Henry Weinhard's, the pioneering producer of small-batch handcrafted beer in the Pacific Northwest, is adding a new summer seasonal to its lineup of craft beers this month. The phrase may be 150 years out of date, but I guess you could say it's true. Of course, it says more about the company's plan for the future than its past--they hope to replace the memory of tin-canned Blitz with an impression of a member in good standing of Beervana's small, indie breweries.At this point, it's difficult to argue that Henry's is anything but a faux craft--one label among many a beer conglomerate hopes to position in the market. Fair enough. But you have to admire Miller's moxie--it is an appealing approach.